Giveaway – Can You Spot the Mistake? I’ve been working on a table topper from the Summer 2012 issue of Primitive Quilts and Projects that features both piecing and applique. The background pieces were cut out a few weeks ago and I spent the past week piecing them together. I felt really triumphant when I completed it on Saturday. The plans was to start work on the applique part on Sunday. However, after looking at it closely, I spotted a mistake…. I felt I could live with it, but after sleeping on it I decided I couldn’t! I spent a few hours Sunday fixing it, but it was worth it. Below is the corrected background. The applique work can wait until next weekend. Just for fun, let’s turn this into a giveaway. 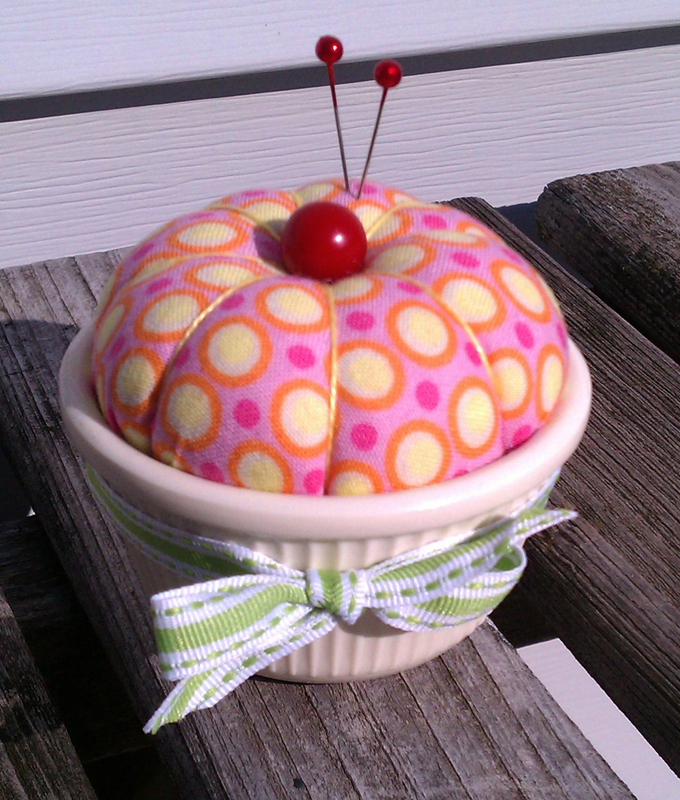 The prize is a cute little cupcake pincushion (color may vary). Post a comment below with what you think mistake is and how you would fix it. All comments will be included in the drawing (even the ones that don’t have the correct answer). Deadline for comments is Sunday, August 5th. Winner will be notified via email and announced on the blog. 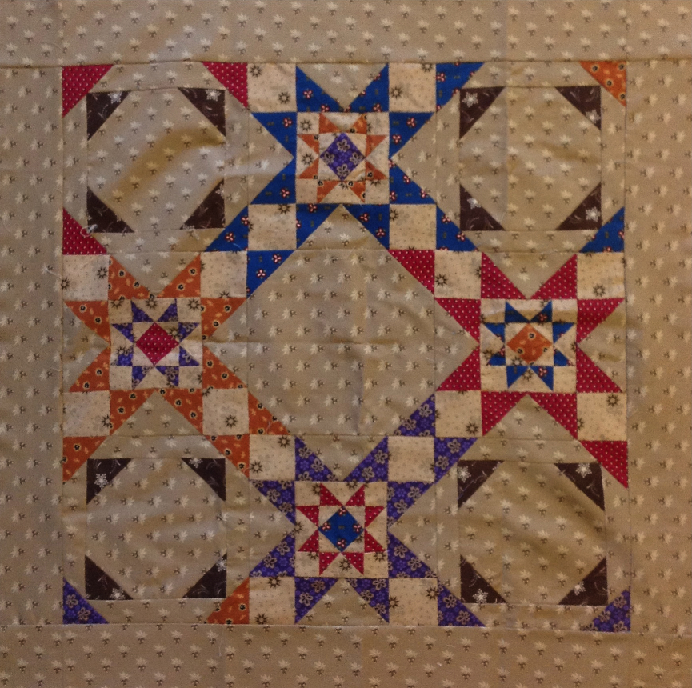 This entry was posted in Giveaways, Household, Quilting. Bookmark the permalink. The blue triangle in the bottom left corner of the top right corner block should have been red? 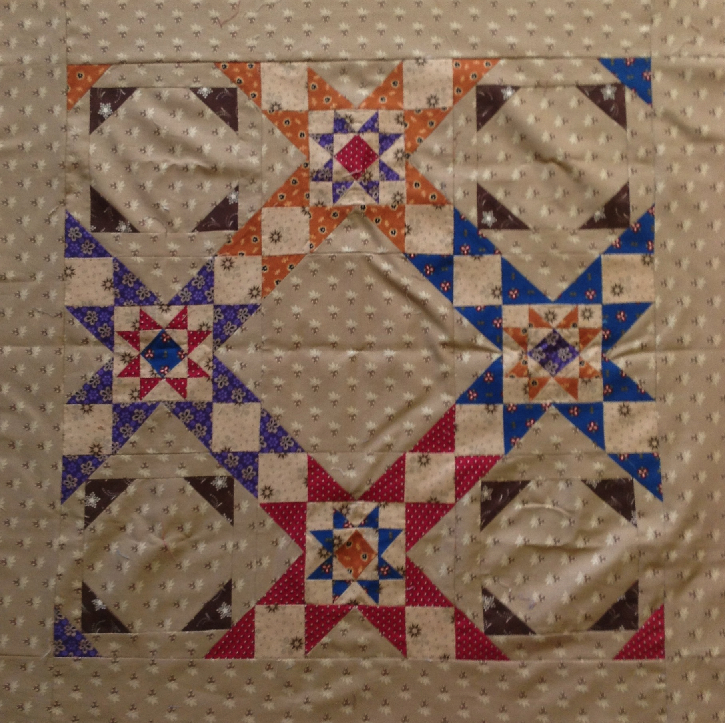 My grandmother always used to say quilts should have a mistake in them. She said only God was perfect, and we shouldn’t try to compete. I would have fixed this quilt by leaving that mistake in and saying I meant to do it 🙂 Gorgeous quilt top, by the way! I really like it anyway. I can’t spot the mistake partly because it looks as if you rotated the quilt in the second picture, or the mistake was more than one mistake with you swapping the three colors outside triangles…anyhow, I agree that mistakes somehow give a quilt its charm….but I am eager to hear from you what the mistake is! With you turning the quilt, it was a little more difficult to be sure. It has to do with the small squares on the outside large blocks.